In The Politics of the Anthropocene, John S. Dryzek and Jonathan Pickering consider politics and governance for the time of the Anthropocene, exploring how it forces us to think anew about ideas of nature, justice, sustainability and democracy. The book not only attunes us to the depth of the challenges ahead, but also provides openings through which our politics can evolve with the dynamism and uncertainties of the Anthropocene era, writes Raj Kaithwar. The Politics of the Anthropocene. John S. Dryzek and Jonathan Pickering. Oxford University Press. 2019. The Anthropocene, a geological epoch in which human activity is a driving force of the Earth system, has become a matter of discussion across a range of disciplines as each attempts to understand the complexities and uncertainties the Anthropocene age is ushering in. 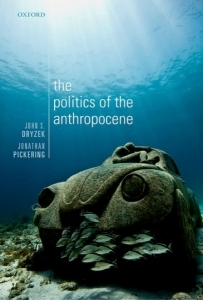 The Politics of the Anthropocene, authored by John Dryzek and Jonathan Pickering, is a new addition to these debates. Dryzek and Pickering attempt to think about politics and governance in the times of the Anthropocene. They break down the challenge of the geological scale for our everyday politics, forcing us to think anew about ideas of nature, justice, sustainability and democracy, in turn rechristening the institutions and practices which shall drive them. They nudge us to remodel our thoughts by giving active space to non-humans as they are shown to be inextricably linked to humans in the material processes of the Earth system. The book does not merely attune us to the depth of the challenges that lie ahead; it also provides openings through which our politics can co-evolve with the dynamism and uncertainties of the Anthropocene. The authors proceed by highlighting the limitation of the institutions which were developed in the Holocene epoch of the last 12,000 years, characterised by an unusually stable Earth System. Instead they outline ‘ecological reflexivity’ as the basic premise for thought and action. Subsequently, they put this concept to use in the ideas of justice, sustainability and democracy. Dryzek and Pickering argue that the dominant institutions of the Holocene, such as states, markets and international organisations, are incapable of facing the Anthropocene challenge. They categorise the ‘pathological path dependency’ of these institutions as the reason for their incapacity. We have been strongly socialised into their necessity because of the success of these institutions in restricting violent conflicts, securing economic growth and achieving a measure of social justice. However, these institutions have been primarily responsible for generating the unstable conditions of the Earth system. By reinforcing their own necessity, systematically repressing information about the Earth system and obstructing alternative imaginings, these institutions create conditions of pathological path dependency. In response, the authors propagate the idea of ‘ecological reflexivity’. This recognises the active involvement of an increasingly unstable Earth system and a commitment to continuous, critical questioning of all ideas and practices. It entails the capacity to effectively ‘listen’ to various human and non-human voices, ‘monitor and recognise’ social and ecological conditions and changes, ‘reflect’ on the state of affairs and ‘respond’ accordingly through institutional practices. The authors believe that such a process will cultivate the ‘capacities of institutions to anticipate and prevent ecological state shifts’. However, they warn that such developments should not be a result of top-down models or outcomes of crises, but should rather emanate from the finesse of a processual development. The authors proceed to rethink the core values of justice, sustainability and democracy for the age of the Anthropocene, in alignment with their call for ecological reflexivity. In the process, they cite various examples, ranging from the United Nations Framework Convention on Climate Change (UNFCCC) negotiations, sustainable development goals to governance institutions such as gram sabhas, to illuminate the traces of transformation which can be further enhanced: one need not start from scratch in building the institutions for the Anthropocene. They float the idea of ‘planetary justice’, which entails a conception of justice that is transnational, intergenerational and open to non-humans. This is because the actions of individuals and societies cannot be restricted to within a state, a generation or the human species. The impacts range across space, time, species and ecosystems, and thus it is important that the capabilities of those impacted, or likely to be impacted, are protected. Acknowledging that disagreements may abound in practice, they seek procedural justice and meta-consensus as a way of ensuring that all voices are adequately heard. Dryzek and Pickering recognise that the idea of sustainability has been co-opted by the dominant institutions perpetuating pathological path dependency. However, they argue that it need not be discarded; rather, it needs to be rethought along reflexive lines. Sustainability in the Anthropocene can be useful if it is open to critical public debate instead of being expert-driven, is ecologically grounded in the workings of the unstable Earth system, dynamic in responding to the interactions of the Earth system and humanity, far-sighted in an inter-generational sense and integrated with other core values such as justice, democracy and so on. It is not just at the ideational level that the authors make their interventions: they present a vast gamut of actors and the possible methods that are likely to usher in the changes. Underlining the limits of path dependency, they argue that actors stuck in it, such as states, corporations or international organisations, are unlikely to make amendments unless they are pushed towards it. The authors speak of ‘formative agents’ such as discourse entrepreneurs – leaders and activists capable of advancing a discourse – scientists and experts, cities and sub-national governments, the people most vulnerable to ecological impacts and, lastly, non-human nature, to a limited extent. These agents shall give form to the politics of the Anthropocene by shaping and practising the principles of justice, sustainability and so forth in various contexts through the exercise of ‘reason, rhetoric and deliberation’ as well as through non-linguistic means of protest, violence, coercion and visual representation. It is not the operation of formative agents in isolation that is productive, however; they must interact with one another in a conducive setting. This is what the authors refer to as a ‘formative sphere’ or, more specifically, deliberative and ecological democracy that shall enable effective formative agency. In such a setting, robust interaction between ordinary citizens and knowledge experts shall be encouraged, representation or direct participation of the marginalised will be prioritised and critical dialogue over discourses will exist. In addition, ‘listening’ to the non-human will be equally crucial. The means of listening would constitute scientific techniques as well as cultural and social knowledge of the most vulnerable and discourse entrepreneurs. Nonetheless, given the principle of reflexivity, all outcomes and processes shall always be provisional and open to revision. This work is a serious and authoritative effort at imagining politics in the Anthropocene. However, it can be criticised for making a leap of faith in providing a solution. Politics always lies between the diagnosis of what the problem is and what a solution ought to be. It is this zone of transition which is the most messy and complex space: something which gets ignored in the book as the authors highlight the limits of Holocene institutions and prescribe a politics for the Anthropocene. To pick the case of pathological path dependency and the play of productive power of the dominant institutions, the authors ignore the ‘ethical aspects’ which legitimise this hegemony. For instance, Dipesh Chakraborty, while discussing the question of the Anthropocene, has argued that for postcolonial states such as India, the drive towards modernisation was not just a mimicry of the West, but a spiritual mission for advancement of its people. Moving on to a different tangent, while the question of non-humans is registered in the discussions, the perspective of the authors on the non-human would have been solidified if posthuman literature was engaged with more seriously, which is not the case. Dryzek and Pickering take up the challenge of the uncertainties of the Anthropocene and provide a highly fluid yet entrenched pathway to navigate the terrains of the Anthropocene. While we do need to ask what constrains us from making this transition, we need to inject more historically contingent and ethically strong analysis in order to move forward. Nonetheless, this book pushes us to be imaginative while being strongly grounded in its values as it attempts to grapple with the times of the Anthropocene. This review and interview gives the views of the author, and not the position of Democratic Audit. It was first published by the LSE Review of Books blog. Raj Kaithwar is currently pursuing an MPhil in the Political Science Department at the University of Delhi. In the past he has worked on transnational water governance projects at the South Asian University. Currently his research interest falls at the intersection of posthuman methodologies in the social sciences and the transnational politics of water in International Relations.